This page covers how to install, setup, and upgrade the Flipside Creator Tools in order to import your own characters and sets into Flipside Studio. Download and install version 2017.4.22f1 of the Unity game engine (downloads: Windows, Mac). Note: If you're not on Windows, at the Choose Components selection of the installation make sure you check off Windows Build Support. Download the latest version of the Flipside Creator Tools. Open Unity and create a new 3D project. The same project can be used to create all of your custom characters and sets. Import the Flipside Creator Tools package from step 2 by choosing Assets > Import Package > Custom Package in the Unity application menu. After installing the Unity package, navigate to Flipside Creator Tools > Open Creator Tools to open the Creator Tools wizard. You can dock this window anywhere you like in the editor. Install the SteamVR and/or Oculus packages for Unity. This will let you press Play and preview your characters and sets in VR. First, make sure you're on the correct version of Unity. You should be using version 2017.3.1p1 (downloads: Windows, Mac). To upgrade to a new version of the Flipside Creator Tools, download the latest version and import it into your Unity project via Assets > Import Package > Custom Package in the Unity application menu. Click the Continue button in the Set Flipside Creator ID wizard. This will open the FlipsideSettings object in Unity's Inspector pane. Click the Find My ID Online button to be taken to your Flipside Creator profile, where you will see your Flipside Creator ID in your profile info. Note: You may need to log in to see your profile info. 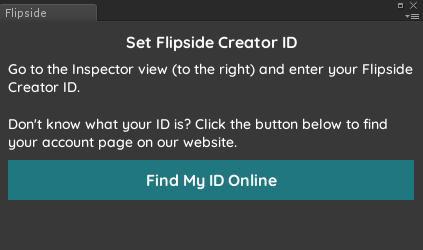 Click on your Flipside Creator ID on your profile page to copy it to your clipboard, then paste it into the Flipside Creator ID field in the Inspector pane. You should now be ready to begin using the Flipside Creator Tools.